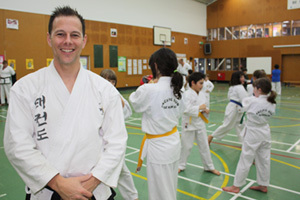 The Whangarei Central branch of Pacific Sun Taekwondo is the organisation’s longest running school, operating out of Whangarei Girls High School in Lupton Avenue since the mid 1990s. Led by Senior Instructor Dion McCracken, the branch is fortunate enough to be the home of several highly experienced instructors. Whangarei Central holds two classes on Tuesday and Thursday nights, with Junior and Senior members training separately.